As a welder, I am always looking for ways to make my job easier and faster. Well, I want to be the best welder possible – so anything to give me an advantage, save me time and advance my skill interests me. So I am always doing research. One item I just discovered is the Everlast power MIG 200. Then I dived a little deeper into the features of the welder and I started to like what I read. Hobart… and the list goes on…. But what’s most important about ANY welder? Better quality components = smooth operation and better welds. With that in mind let’s talk specifically about the Everlast Power MIG 200. 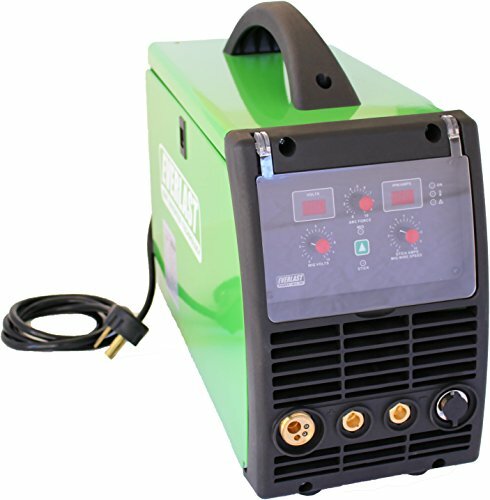 The Everlast 200 is a combination welder. It can handle MIG welding. It can Handle Stick welding. It can handle Flux welding. So far I like the combination, it sounds like a capable welder. That means goodbye stuck wire. How frustrating can that be? I know it frustrated me – especially when a ball formed on my wire and now I have an erratic arc start! And the spatter ball messes up my nice workpiece. Now your wire will not freeze in the weld pool and will be cut to a preprogrammed size. You are set to drop a new weld right after your last pass. Capable of the stick when needed. Now I know this sounds amazing! This welder seems to have more good features that outweigh the concerns. She runs like a dream let me tell you. Based on the reviews I think the Everlast will do well in my shop. It’s never let me down on a job site or in the shop. I’ve also heard good things about the cheaper Lotos 140. A good ear protection review can be found here. But only in my shop. And that can mean wire delivery would be poor. I never used it before. The shielding gas flows to the workpiece BEFORE your weld hits! It’s a good welder at a fair price – comparable to Hobart and Miller – but with more features. The knobs are analog and the readout is digital so the numbers jump around a lot. Everlast guns are expensive. Click here to see the original testimonial from J.W. On paper, this sounds like a great welder. It has all the features of a higher end brand but with a few hundred dollars in savings. I really like the MIG and Stick combo – you can do quick home projects AND heavy repairs with one machine. With the cool add-ons like the automatic pre and post flow and the burnback and the lightweight, I think it’s a solid welder to own.